Well turns out I missed last week. Just been busy since I got home from my trip and I've not been able to keep up. However, I do have the new episode up and running. 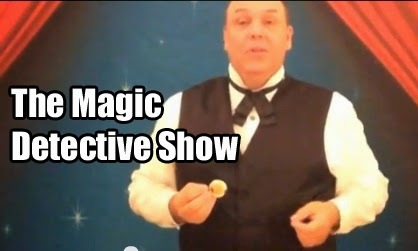 It starts with another trick from the world of Professor Hoffmann. I found what I thought was an unusual trick with a borrowed pocket watch that appears inside a glass of milk. I presented the trick as per the instructions in the book, along with a homemade gimmick that I made fashioned after the one Pro. Hoffmann illustrated. I did have to make a few modifications because in the book the magician gets the help from an assistant. In this case, I had to do everything. One thing I found was that this was a fairly tricky thing to pull off. Despite how it might appear, a mirror glass is not used. The glass that is turned and shown empty and then filled with milk truly has NO pocket watch inside when the milk is poured in. At the conclusion of the trick the pocket watch appears to be dripping with milk, however that is all part of the illusion and the watch is never in any danger. It's definitely a stage trick only. Interestingly, there is a trick in Tarbell where a borrowed watch appears in the soil of a potted plant that has similarities to this effect. The last item on the show is a photo of FuManchu's grave which I received from Martin Pacheco. I had always heard and I also read it in Genii, that David Bamberg/FuManchu got a burial at sea, in other words his ashes were scattered into the ocean. It turns out this was wrong and indeed he was buried in Argentina. But because there was no upkeep on his grave, Bamberg's remains were eventually moved to a common grave and the whereabouts today are sadly unknown. Enjoy the episode. It may be a week or two before the next one is up. I've got a busy schedule of shows and some personal things to tend to. By the way, sorry for the slightly blurry footage this week. I'm not sure what was going on, but I was in a rush to get it all shot and this was the result.